When I last blogged about the Syrian refugee crisis September 16, Stephen Harper was still in office and offering to bring in a paltry 10,000 refugees over the next three years. It was a promise he later revamped to 10,000 by year end when, closer to the election, he realized he was on the wrong side of history and public opinion. How quickly — and in this case, positively — times change. Stephen is gone! We now have a much more progressive and open-minded prime minister, one elected in part on the commitment to make Canada home for 25,000 refugees by year end. Unfortunately, the logistical problems of simply processing this vast number of refugees in such a short time frame resulted in a small change to the Liberal plan. It is still 25,000 in number but now the deadline is early 2016 instead of year’s end. In the time frame between the Paris attacks and the November 24 Liberal government announcement about the new timing, some Canadians suggested that ISIS might infiltrate the incoming refugee stream, so we should either put on hold the refugee program or eliminate it altogether. I likened this response to what I thought was a hypothetical question: What if, in the midst of the Second World War, we had rejected Jewish refugees on the basis there was a hypothetical risk one or two Nazi sympathizers would hide amongst them? Hopeful faces aboard the SS St. Louis hoping for safe refuge from Nazi persecution. With over 900 Jewish refugees aboard, the ship was denied port repeatedly, ultimately returning to Europe where almost a third perished in the Holocaust. Watching Amy Goodman on Democracy Now! the other night, I was saddened to learn that my “never would happen” hypothetical in fact did happen. But it was the US and Canada that had rejected Jewish refugees, and it was just prior to the war. A very moving film done in the 1970s, Voyage of the Damned, re-enacts the whole story. 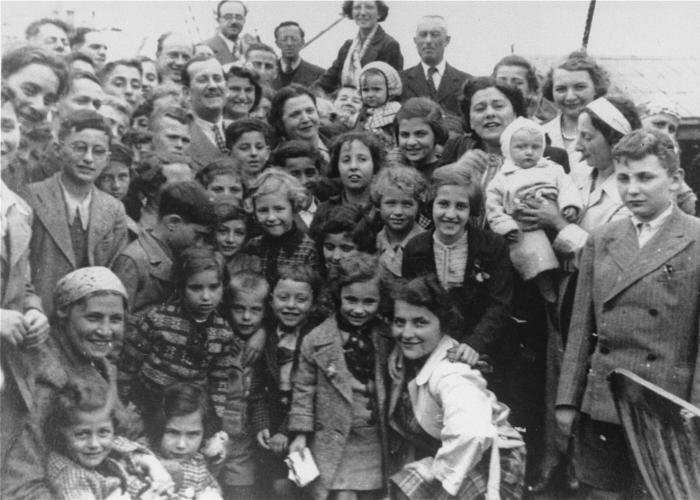 In 1939, the SS St. Louis set sail from Germany with about 300 Jewish refugees on board. After docking first in Cuba, where the authorities would not allow anyone to disembark, the ship then set sail for the United States. But the US Coast Guard would not permit the SS St. Louis to even enter American waters. The ship’s captain then contacted Canada but was turned away there, too, so they had no choice but to sail back to Germany. Some of the refugees on board were so distressed they jumped off the ship and drowned at sea. Among the passengers on the SS St. Louis were Anne Frank and her family. Fortune Magazine published a survey about the same time in 1939. There was a bill before Congress to admit 10,000 Jewish refugees from Germany, many of them children, and the survey showed about 60% of people opposed the idea. One of the arguments put forward in opposition was — you got it! — that Nazi sympathizers might sneak in amongst the Jewish refugees. A recent Washington Post article about this story went viral. So in this case we could say, how little times change! But in Canada, thankfully, we appear to have a PM who is not going to be bullied by scare tactics and fear, and Canada will become home to 25,000 Syrian refugees, albeit a few weeks later than originally planned. If you want more reasons why we should welcome these people fleeing their homeland, check out Canadian Michel Huneault’s moving photos in Geist. The shot of a Syrian woman peering through the window of a refugee bus in Vienna, tears streaming down her face, says it all. I hope we can make our future new neighbours feel welcome. This entry was posted in equality, refugees, social justice and tagged Canada, Second World War, SS St. Louis, Syria. Bookmark the permalink.